Industry Experts published an updated 2017 version of the global market research report on Medical Ceramics. As per the new version entitled ‘Medical Ceramics – A Global Market Overview’, dental implants estimated to be the largest application sector with 4.5 billion in 2017 and also projected to be the fastest growing during the analysis period 2016-2022 with a CAGR of 6.7%. Ceramics constitute a family of materials that are produced by firing non-metallic materials at high temperatures. Two of the most common materials that can be utilized for manufacturing ceramics include alumina and zirconia. These can be fabricated in such a way as to increase their biocompatibility, following which they are called medical ceramics or bioceramics and find application in the medical industry. These materials are extensively employed in surgical implants, prosthetics and a number of medical tools and devices. The non-toxic nature and high mechanical strength of medical ceramics, coupled with negligible or no tissue reaction are the major characteristics that render them to be used in medical applications. On the basis of type, medical ceramics are classified, in this report, as Bioactive, Bioinert and Bioresorbable, with Bioinert being the largest, as also the fastest growing category. In comparison to metal and polymer materials, these ceramics are inorganic, non-metallic solids that have strong compressive strength and are brittle. Zirconia (ZrO2) and alumina (Al2O3) form the two most widely used bioinert ceramics owing to their chemical stability. Bioinert ceramics find application in bone tissue applications due to their features, such as biocompatibility, non-toxicity, non-inflammatory, non-allergic, non-carcinogenicity and bio-functionality. These ceramics find wide use in dental and orthopedic implants and demand for them in these areas is likely to maintain rapid growth. This global report analyzes the key applications of medical ceramics including Dental Implants, Implantable Electronic Devices, Orthopedic Implants, Surgical & Diagnostic Instruments and Other. The global markets for the above-mentioned applications are analyzed in terms of value in USD for 2014-2022 analysis period. Accounting for an estimated share of 31.2% equating to US$4.2 billion in 2016, Dental Implants represent the largest application area for Medical Ceramics globally, demand for which is forecast to be US$4.5 billion in 2017 and is projected to reach US$6.2 billion by 2022 to reflect the fastest CAGR of 6.7% between 2017 and 2022. The worldwide market for Medical Ceramics has been categorized into five major regions namely North America, Europe, Asia-Pacific, Latin America and Rest of World. The regional markets further analyzed for 13 independent countries across North America – The United States and Canada; Europe – France, Germany, Italy, and the United Kingdom; Asia-Pacific – China, India, Japan and South Korea; Latin America – Argentina, Brazil and Mexico. 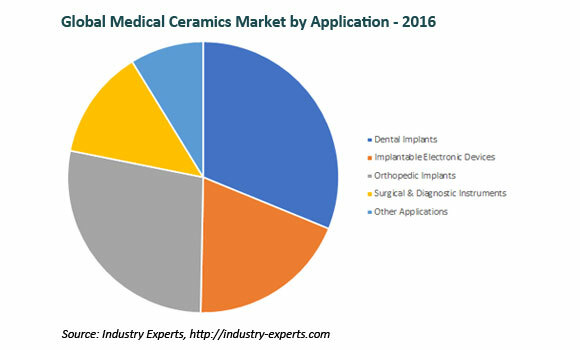 The market for medical ceramics is analyzed in terms of value in USD for each region by key country, ceramic type and key applications. This 312 page global medical ceramics market report includes 193 charts (includes a data table and graphical representation for each chart), supported with meaningful and easy to understand graphical presentation, of market numbers. This report profiles 44 key global players and 58 major players across North America – 24; Europe – 25; Asia-Pacific – 8 and Rest of World – 1. The research also provides the listing of the companies engaged in R&D, manufacturing and supply of medical ceramics. The global list of companies covers the address, contact numbers and the website addresses of 90 companies.